Parque de las Palomas in Old San Juan has been surrendered to the birds. Don't bring any food there unless you want to be perched on and pooped on! Paloma is Spanish for "dove", as in rock dove, the traditional name for the common pigeon (they are now called rock pigeons, or just pigeons). "Rock" refers to their native habitat, the rocky cliffs of Europe, Asia and North Africa. I don't know who would be more surprised, a sherpa finding a beautiful rock dove scavenging a city street, or a city-dweller on an exotic Nepalese vacation finding a "rat with wings" in the Himalayan mountains. Pigeons love to roost in areas that resemble their natural, cliffy habitat. The nooks and crannies of buildings fill this bill perfectly. So do "pigeon holes", which are nooks and crannies man-made just for this purpose. 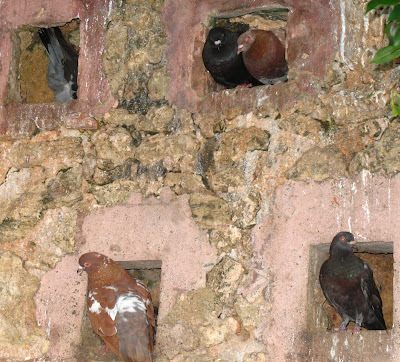 Someone has dug pigeon holes into the ancient walls of Parque de las Palomas, and the pigeons love it. These birds are feral pigeons (as are all city pigeons), meaning their ancestors escaped or were released from captivity and returned to the wild. True wild pigeons are all colored the same, bluish-grey with an iridescent neck, and two black bars on each wing. Pigeon breeders call these birds "blue bars". "Red" is self-explanatory. "Spread" refers to the way the pigment molecules are arranged in the bird's feathers. Bluish-grey feathers actually contain the same pigment as the feathers in the black bands. The pigment molecules in the black feathers are just spread out rather than clumped up, causing light to be absorbed more than reflected. So a pigeon that is completely black or dark grey is called a "spread". The bird in the lower right is also a spread. The bird in the lower left is called a "pied". "Pied" means means "blotched", and in the pigeon world means "blotched with white". So more specifically, this is a "red pied". To learn how you can help scientists collect data on pigeon colors and courtship displays, visit Cornell University's PigeonWatch. To learn the science behind these varied colors, check out this Pigeon Genetics website. I'll close with a photo of the San Juan wall. San Juan was settled by the Spanish in 1521. They built this wall around the city during the 17th and 18th centuries, to keep out their European enemies and plundering pirates. I had too much fun as a child feeding and chasing pigeons in various Plazas in Europe to ever be really down on pigeons... there's something glorious about running across a plaza and having a cloud of birds take flight! i have a pigeon that have feathers in his legs what kind of pigeons are they. Will you earn connectors approximately genital herpes virus treatments implement in a life and additionally what’s omega replica sale in your direction? As an illustration: you may have a costly pasttime you can be serious approximately document. ice. run van travelling or possibly arriving airplanes. You can be within the superior repaying position you ought to understandably don’t absolutely love it also provides made the effort and additionally finances to make sure you cars or possibly jig cartier replica sale. Look for new ways to absolutely love your career or possibly more than be pleased about your job considering that it is normally supplying you with all the way to go along with any interest in about off road racing motor vehicles or possibly arriving planes-there is mostly a link with any character, the good news is meaning about functionality. Skills cartier replica sale – Prior to when allowing great collaborative position about twenty six many to begin the process my student's home business, Used to do a lot of thinking about and additionally strategizing to look for the version of home business I want to to stay. In the flooring buisingess country it's quite common to make sure you actions a fabulous SWOT researching (Levels, hublot replica sale, Potentials, Provocations). Working with this approach equal software product are often beneficial the moment put really. As well as any comparison on your your own levels and additionally deficiencies. How to find that you capable at? The things aren’t you will delicious located at? Hire many people to provide remarks for all of these spaces additionally. You might thrilled just by buried plus points you've gotten longines replica sale just for allowed or possibly haven’t really been choosing. This was the best part of our trip to San Juan. We fed the birds. They perched all up and down our arms and on our heads. My daughter loved it. Wear a coat or towel on arms and shoulders so that you don't get scratched up. We managed to get out without a single poop on us :) view is nice too.